This giveaway is sponsored by Parrot Uncle, but all opinions are 100% mine. I only recommend products and businesses that I believe in! Would you be willing to help me choose a new light fixture to hang above my kitchen table? I want to give you a little background first, but before I do that, I want to let you know not to miss the easy to enter giveaway at the bottom of this post! I’ve shared quite a few images of the breakfast area in my kitchen with you since we moved into the house that we’ve been remodeling for the past year. The very first one was when I repurposed a dresser from The Salvation Army into a table linens storage chest. You can read about exactly what I store in the chest HERE. This photograph was taken when we were still early in the unpacking stages after moving into our new-to-us house. The remodel of the kitchen half of this room wasn’t complete at this point and things in the breakfast area were still looking a bit sparse. 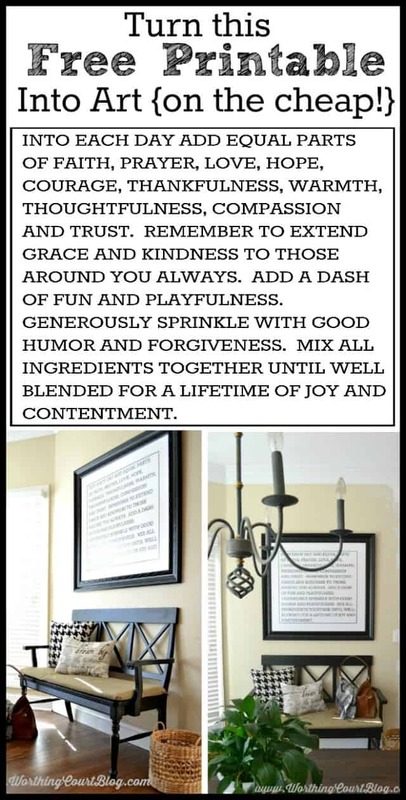 I shared the other side of the room when I created a free printable that I framed and hung above the bench that used to be in the foyer of our former home. BTW, you can get the free printable HERE. It’s available in two sizes – printer paper size 9″ x 11″ or in 34″ x 36″ size for creating large artwork. 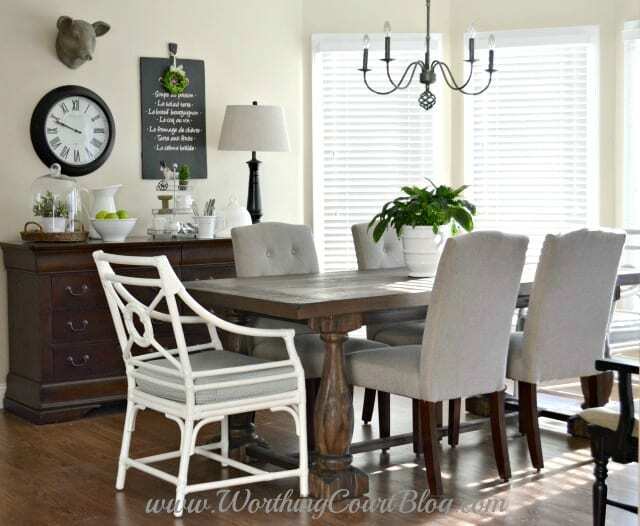 The most recent view of the breakfast area was when I shared some changes to the kitchen gallery wall along with my fall sideboard and the fall kitchen table centerpiece that I put together. You can see more of those HERE and HERE. Even though all of these photos were taken at different times and from different perspectives, they have something in common. They all include a glimpse of the light fixture hanging above my kitchen table. The light fixture is the one that was in place when we purchased the house and I’ve always been on the fence about it. I don’t strongly dislike like it, but I don’t love it either. It’s just sort of okaaay. I knew that if I kept it, it would have to be removed and painted because even though you can’t tell it in my photos, it’s actually painted the verdigris green color that was hugely popular in the 80’s and 90’s. I even gave some thought to giving it a bit of a makeover with the addition of some rope. But in the end, I’ve decided to replace it with something more to my liking. I’ve been dreaming about having a vintage-look rustic/industrial style light fixture above the table for a while. After lots of both in-store and online searching, I came across Parrot Uncle. 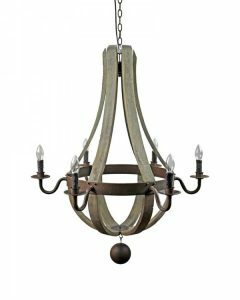 They offer a huge selection of pendant style fixtures and economical vintage hanging lights. When I found out that their prices are up to 50% off of retail plus that they offer free shipping and free returns, that sealed the deal for me. Here’s where you come in. Would you help me make a decision on which light fixture I should choose? Parrot Uncle has so many to choose from. I’ve narrowed it down to all of these and can’t decide which one to get! Leaving a comment with your vote for which chandelier I should get will enter you in the giveaway. Scroll on down for easy entry. Please note that this giveaway is open to USA residents only and you must be 18 years of age to enter. For those of you who subscribe and read Worthing Court via email, you will need to click over to the actual blog to leave your comment to be entered into the giveaway. « The Scoop Link Party #193 – Hundreds Of Decor Projects, Recipes And More! I love the vintage industrial iron rectangular style. It was a hard choice but I like the Iron Hemp Rope Chandelier. Best of luck with your choice. My favorite is the 6 Light Wooden Pendant – Flask Shape. I liked all of them, but the 6 Light Wooden Pendant is my favorite. Hi Suzy! I like the 6 Light Wooden Pendant the best! Would love a tour of your new home someday! Love the pics but would love it more in person. They are all soooo pretty and honestly, you can’t go wrong with any of them! My favorite though is the horizontal rectangular fixture. It looks like it is a substantial size to fill up the space and I love that it is the same shape as your table. I love the 6 light wooden pendant. My friend has this above her kitchen table and it is beautiful. It is very different and will make a statement. I think with your rectangular table, the vintage iron rectangular horizontal fixture would look amazing. The six light vintage industrial would look wonderful in your space. I personally feel that the wooden flask shaped lights are a passing fad. I really love the rectangular vintage industrial. I’d vote for that if it’s not too big for your area. I like the flask shaped wooden pendant. 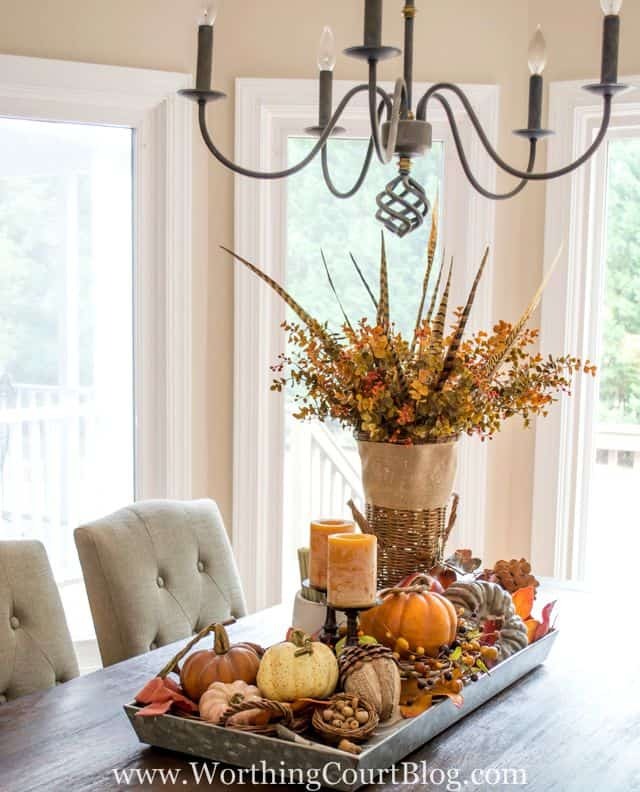 Your table looks like it could use a heavier looking chandelier because of the length of the table and larger legs. Thanks so much for sharing Parrot Uncle’s website! I’ve never heard of it before, but now I can afford a big, beautiful vintage chandelier I’ve been wanting! I love the 8 light black iron hemp rope fixture. I like having a different shape than the table. Your table looks substantial and this fixture is great without over powering the table. You mentioned using rope if you kept the other one, so I’m thinking you might like the rope on this one. Good luck, they are all great! I like the flask one or the rectangular one because those are the most different from the one you have and would look nice. The rectangular is my favorite. Love the wooden pendant. Your home is beautiful. 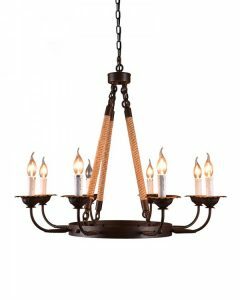 I like 8 Light Black Iron Hemp Rope Chandelier the best. Very classy. Great choices Suzy! I really like the 8 light black iron hemp rope the best. The rope is a great contrast to the iron both in color and texture. Also though it can stand alone as a design element, the shape won’t detract from your beautiful tablescapes and centerpieces. I would choose the first one (wooden flask shape) or the third one (rectangular iron one, which is probably my favorite one. I’m also a big fan of the beaded chandeliers. 6-light wooden pendant would look awesome! I have to go with the 6 light wooden flask shape followed by a very close second for the rectangular industrial iron. I like the wooden pendant. You should have bought the one we saw On sale at Pottery Barn!!!!! ?? I like the six light wooden flask shape. Good luck! I like the industrial look rectangular fixture. It is a bit unexpected in the look, and for that reason, plus the shape, it is appealing. Either the flask or rectangular would be beautiful with your table. 6 light wooden pendant flask shape. I feel it has a more architectural design. I like the black iron hemp rope chandelier. 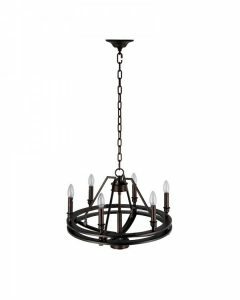 I like the black iron hemp rope chandelier. It looks very nice. They are all beautiful in their own way, but I like the Iron Hemp 8 light the best. I can just see that at Holiday time with pine boughs and the rest of the year you can switch out lamp shades if you are so inclined. It’s a versatile piece that you won’t tire of because of the changes you can make to it. 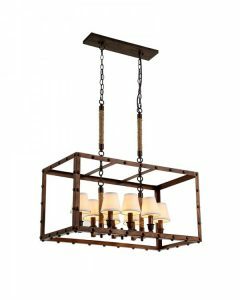 They are all great, but my favorite was the 6 light vintage industrial pendant! I love the six light wooden pendant. It looks like a chandelier, but it’s not too fussy nor dressy. Whichever you choose will look great in your beautiful room. I like the iron chandelier with horizontal rectangular frame design. I vote the vintage industrial. I really love the 6 Light Wooden Pendant – Flask Shape. Oooh new light fixutres are so fun. I think the industrial one is my fave!